Destiny is big on its customisation, but there's one thing missing - beards. 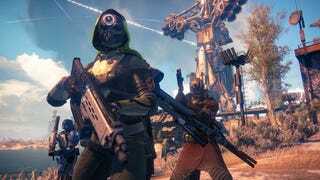 This came to the fore when I asked Jonty Barnes, director of production at Bungie, what the team had learned after Destiny's beta. "Here's a funny one for you - this was a surprise - beards. I am not kidding you," he said. "The amount of requests for beards - and this isn't just people, this is cultures as well that find them very important." "The dialogue that's going on in the studio is 'we prototyped beards at one stage and we were looking at it, but it wasn't a priority - but now maybe we should be thinking about that in a very serious way.'" "Natasha, who was working on the hair implementation in Destiny, is having this active conversation about what it would take, whether or not we can deploy it, if it's something we're going to do very soon [or] a while from now, what's the impact of it, how do we get players to suddenly be able to define a beard because they haven't done it before." "But that's like wow, really? This is the big topic people are talking about coming out of the beta? For the graphics team, hell yeah! They are all on it. They want beards. They want to be able to give that. That's super-fun. If that's the biggest concern for the graphics team: great!" "But that's just the passion that people have for making the game as good [as it can be] and meeting the demands of players. There's no question that's going to be something they want rather than 'well, they think they want it but they don't' - this is one of those things [people do want], and has absolutely risen up the graphics priorities as a result." "I don't know when you're going to have beards, but I'm pretty sure by the end of time there will be plenty of beards in Destiny." Beards? Beards. Beards as far as the eye can see, for the rest of eternity. It is a beard-based Destiny. And as long as they're beards like this, we should all be very happy indeed.